Deer don't always sleep much at night -- they typically use the cover of darkness as protection against predators. When they do sleep at night, they do so in such a way as to conserve energy, stay hidden and guard themselves against predators. Ultimately, deer sleep efficiently and with self-preservation as their biggest concern. Deer usually hunker down in areas where they aren't visible or exposed. Tall grasses, brush and dense foliage are all preferred spots, as they at least partially hide the animal away from easy visibility at night. This often leaves a distinct physical impression in the brush, which hunters and ecologists may use to track the movement and habits of local deer. Deer don't hibernate in the winter, so when nighttime temperatures reach frigid lows, they have to find a warm spot to sleep in. 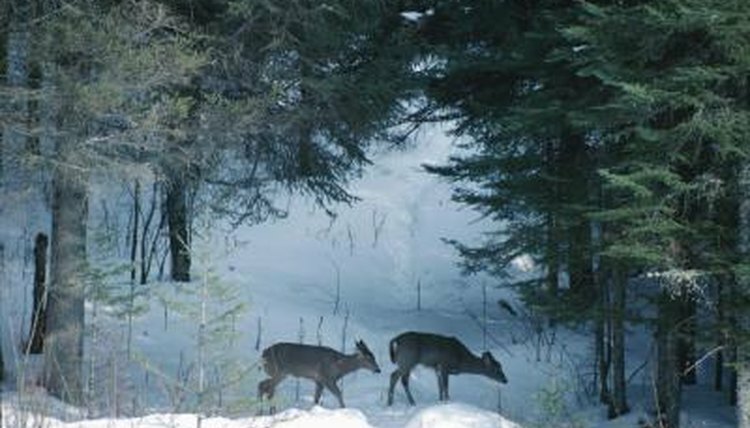 When the temperature drops, deer often take shelter sleeping under coniferous trees like pine trees. The dense, low branches of these trees both protect the deer from wind and falling snow while creating a makeshift roof that holds in heat. This allows them to conserve their energy, which they need to stay warm and avoid predators when need be. Because a deer often relies on the cover of darkness that comes at night for protection, he doesn't let his guard down for a deep sleep. Deer are very cautious animals, always wary of predation, so they don't sleep throughout the night. Rather, they doze off for shorter periods of time, allowing them to remain alert and guarded. When one sees a predator in the area, he alerts the rest of his group with a loud snorting sound. Their irregular nighttime sleeping habits allow deer to conserve energy and rest while still taking advantage of the darkness. These animals are more active at night than they are during the day, even though the day is generally warmer -- in winter, deer sleep in direct sunlight to stay warm. At night, deer move frequently and walk into the wind, so that they can respectively avoid and detect predators in the area. Ohio Agricultural Research and Development Center: Smart Stuff with Twig Walkingstick: Deer Me: Where to Sleep?